Enjoy fabulous Florida weather and great Golf, Tennis, Beaches, Boating, Nature & More! and Mullet Creek Islands to explore just behind Aquarina! Secure gated community is ideal for full-time or seasonal residents. All this and more to enjoy in a tropical Florida setting! and The Hammocks, perfect for vacation retreats! Come enjoy the coastal Florida lifestyle of your dreams! Welcome to Melbourne Beach! 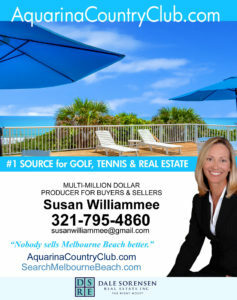 I’d love to help you with real estate here in Aquarina Beach and Country Club or anywhere else in our lovely barrier island community.